A reading from Exodus 12:1-14. This may be familiar to you as it is a reading assigned each year for Christians to hear on Maundy Thursday. Listen for God’s word to us. Today in Sunday School we learned about the Rule of Life. I know it’s not entirely fair to tell you about it after the fact, but it is Christian Education Kick Off Sunday. Maybe you’ll be intrigued enough to plan to attend adult Sunday School in the weeks to come! And if you’ve already been there, see if I miss anything important! . . . The Rule of Life is an ancient practice, sometimes referred to as living life by a Spiritual or Sacred Rhythm. The idea of a Rule of Life is to arrange our lives for spiritual transformation. We commit to particular daily, weekly, monthly, even annual practices to keep ourselves open and available to God. We set a framework for our lives with time for God to come in and do what only God can do. Thus, we participate in the miracle and mystery that is spiritual transformation. Day after day practicing certain spiritual disciplines like centering prayer or daily scripture reading or even a particular weekly service project in the community undertaken as a part of one’s Rule of Life to give God the space to show up in ways we can’t anticipate to work on us from the inside out. As we were reminded in class today, we live in a world of rhythms. The waves ebb and flow. The seasons change predictably from summer to autumn to winter to spring. Even our breath is a rhythm – and our heartbeat and our brain waves. All are necessary rhythms we cannot live without. Ruth Haley Barton claims that there are rhythms that are so necessary for us spiritually that “if they are not present in our lives, we probably are spiritually dead” (Sacred Rhythms DVD, Session 6, Learn In). If we are not practicing solitude which simply is time alone each day with God if even for only 10 minutes. If we fail to carve out this time with God, we soon will feel cut off completely from our Source. If we never allow ourselves to get quiet to listen in a daily practice of silence, how will God have the chance to energize, as well as stretch us? . . . The idea of The Rule of Life is to arrange our lives according to our deepest longings . . . our spirit’s deepest desires for God – be it peace or connection or love. In our lesson today, we were reminded that the great spiritual leader Thomas Merton once wrote: “Ask me what I am living for and what is keeping me from living fully for that” (Ibid.). Who among us isn’t willing to arrange our lives for what we really want? . . . For children of God, hopefully among our deepest longings is a desire for God. Maybe it’s to bring delight to the Divine, or to live a little bit more like Christ in order to experience abundant life now, or just to go deeper into union with God which will lead us out into the world renewed. In the Exodus reading for today, the people of God are being instructed in a practice that will be an annual part of their Rule of Life. It will be a communal practice – something whole households will do together each year as a remembrance of the night of God’s decisive action. We likely have heard of Passover; the high Holy Day our Jewish ancestors still observe not only to remember the past, but also to keep themselves open and available to God today. When at last Moses went to the Egypt’s Pharaoh to deliver God’s message to let God’s people go, the command was met with defiance. No way was Pharaoh about to give up the free labor the Israelites were forced to provide. According to the story, it would take ten miraculous acts before the slaves were liberated – the tenth being an act so violent that many of us have difficulty reconciling the destruction of the firstborn of every creature living in Egypt as an act undertaken by God. The Passover is instituted as the blood of a spot-less male lamb hurriedly is splashed over the door of each Hebrew home. Thus, the blood was a sign for no harm to come upon that house. Its inhabitants belonged not to the Pharaoh, but to God. And the ones inside had better be ready. Loins girded, sandals on their feet, dough not yet risen in the bowl. When at last freedom came, it was a dash out into the night at Pharaoh’s request to go! 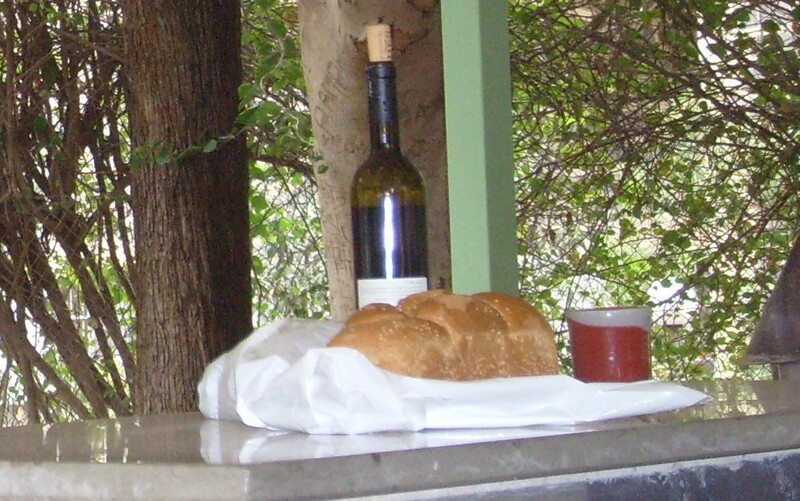 Passover is an annual practice in a Rule of Life centered around the freedom we have in God. It is essential because it defines the people of God. We can read the whole Exodus story as a clash between two Sovereigns – or between One Holy, High Sovereign and another who just thinks he is. Soon enough we’ll get to the ten commandments with its classic thou shall have no other gods before me. Freed from the chains of Egypt’s claims; the people of God need an annual, weekly, and even a daily practice to know the One to whom they really belong. They need to arrange their new lives in such a way that they never forget. They belong to the Sovereign who acted for their benefit and continues to do so every day. It’s our story too so that our Rules of Life, our own Sacred Rhythms demand rest in order to know the Master to whom we always have belonged. One who desires us deeply enough to ensure praise to our Creator ever remains on our lips. In that light, it might be high time we each got clear about our own Rule of Life – if we don’t already have a Sacred Rhythm to which we have fully committed. It doesn’t have to be something imposed upon us. In our class lesson today, we learned the characteristics of effective rhythms. Things we must keep in mind as we arrange our lives to stay open and available to God. Connected rightly to our Source. Our Sacred Rhythms need to be personal to us. I would argue that there are certain disciplines disciples of Christ need in our lives. Like, we need to commit to weekly worship – gathering with one another when our hearts are full of gratitude, when they’re breaking, and even when they are bored. And we need practices for our days that uniquely feed us. I have to be outside in silence with God for at least ten minutes each day. When I’m not, the souls of my feet cry out for the feel of the grass under them. I know someone who creates a mandala – a circle of wholeness from whatever bits of nature she finds each Sunday outside on a walk through her yard. Maybe you have to use your body to create music or movement or a beautiful work of art. Commit to it as a spiritual practice – as a time in which God can show up to work in you. It doesn’t have to be a lot of things each day. Don’t overcommit. One daily spiritual practice is enough. We might even re-purpose things of our lives that we already do but do them now with the intention of allowing that act to keep us open and available to God. The spiritual life isn’t about practices that bore us to tears. I suggest building monthly review into our Rules of Life so we can assess now and again and change course as needed. A good Rule of Life is realistic about the demands of our lives. If we’re working a job that takes us out of the house for twelve hours each day, it’s likely we won’t have anything left for an extended time of silence every night. In those circumstances, it’s unrealistic and shouldn’t be attempted. Last week in Sunday School, we learned about the practice called the Examen. A practice I once heard referred to as sleeping with bread. Ten minutes before bed – maybe even as you’re brushing your teeth and getting yourself ready on auto-pilot at night, or in the morning if that works better for you – review the past twenty-four hours with God. Name how you woke up, what you did to care for your body, how you interacted with others, and even what you did throughout the hours of your day. Look for traces in your day of seeing the Spirit of God at work – surprising you, guiding you, maybe even making you a little bit better at handling life’s situations – which is evidence of the Spirit’s expansion in you. Confess before God the ways you weren’t who you wished you would be. And commit to beginning again tomorrow. Then simply thank God for every breath of your day as you lay your head down for the refreshment of the night. The Examen is a simple enough spiritual practice to make a part of one’s Rule of Life. Over time, it can bring us great wisdom and deeper compassion for ourselves and others too. We’ve got to make sure the practices to which we commit are life-giving to us. It’s a good idea as well to take on one practice that stretches us a bit to keep ourselves growing towards wholeness. People who lose themselves in talking with others, need the discipline of silent time alone with God. And those of us who otherwise would ignore our bodies, need to take a holy walk around the block to feel the way God amazingly created this home that is us. In it all, we must remember grace. Rules of Life are not meant to enslave us. We must hold them flexibly – knowing some days unexpected events occur. Tomorrow we can get back to our Rule again. . . . It’s how we stay alive with God as God lives more fully in us. How we keep connected to our Source and remember the Master to whom we really do belong. We don’t need to make ourselves into some other people for God. We only need to arrange our lives in ways that keep us open and available. Just like in Egypt, we can trust; God will do the rest. This entry was posted in Sermons and tagged 10 September 2017, Exodus 12:1-14 sermon, Mandalas, Nature, Passover, Pharaoh, Rule of Life, Ruth Haley Barton, Sacred Rhythms, Sovereign, Sovereignty of God, Spiritual Practices on September 11, 2017 by RevJule.